grandma's cookie jar: Let Them Hear It From Us! 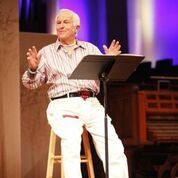 The other day I shared with you my notes from when Josh McDowell spoke at the first-ever Legacy Grandparenting Summit. While there were many things he said which stood out for me, things I will be intentional about doing with my grandsons, there is one thing which I believe is the most important thing for me to do. What is it, you ask? It is for me to be sure they hear, know and believe the truth about how no matter what, they are created in the image of God and have infinite value, dignity, worth. Josh said we need to love our grandchildren the way Jesus does and communicating this message is a great place to begin! This world will try to tell them they are not created in the image of God - they are just an accident of evolution. It will try to get them to believe for them to have value, dignity and worth, they have to conform to the "values" of the society in which they live. These things are not the truth. In fact, they are lies from the pit of Hell. I want my grandsons to know the truth. I want them to hear it from me - every time they see me or hear from me. I want them to believe the truth, so it frames how they see themselves and most importantly, their relationship with God. If my grandsons know and believe they are created in the image of God, they will know and believe they are not accidents; rather, they were made on purpose by God and will grow up trusting Him! If they know, no matter what, they have infinite value, dignity and worth, they will see themselves as God does and will not try to have things or turn to this world to try and find this sense of value and worth. So, I commit to be focused and intentional about communicating this important message to my grandsons. I will tell them no matter what, they are created in the image of God and have infinite value, dignity, worth. They will hear it from me and see it in the way I look at them and treat them, because I am an intentional Christian grandparent; I know and absolutely believe grandparenting matters . . . and this message matters! Won't you join with me and commit to be an intentional Christian grandparent who communicates this message to your grandchildren, too? Let them hear it from you!